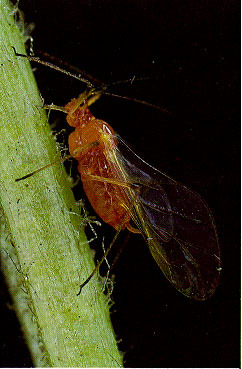 So without the virus, the aphids don’t grow wings, and they’re not able to disperse to new sites. When infected, they can sprout wings, and spread to a new site. Presumably without a flying aphid to carry them the virus can’t disperse, either. Apart from anything else, my kids, having learned about this at dinner,3 are now hoping to have their wings turned on the next time they’re infected with a virus. Wow that’s cool! But also confusing. This virus has virtually no genes. So what service is it providing? Why rely on a virus to make wings when it’s apparently possible for insects to grow them on their own? Some speculation on the mechanism would have been nice. Nonetheless, thanks for the interesting find.